It’s pretty common knowledge that I hate scary movies. I just don’t watch them, or else my over-active imagination haunts me for days. Halloween can be a touchy time for me…you never know when you might flip on the TV and accidentally see part of a horror flick marathon. So it was great that this afternoon was the annual trick-or-treating night with the horses. The kids put on their costumes and dress up the horses, and a group goes through the nearby subdivision. The people who live in the neighborhood bring candy out for the kids and apples or carrots for the horses. This is a tradition that everyone really seems to love – and it’s a perfect festive activity for me! It was a ton of fun and the costumes were super cute. There was a unicorn and a princess, a Native American horse and rider, Wonder Woman and her trusty steed, a ninja turtle, and a cowgirl, plus a Santa baby (literally – an adorable baby dressed up as Santa). It was a beautiful night for it, and the horses were a hit with the kids in the neighborhood. It made for some really sweet photos! The horses did great overall. Knightwind was a little nervous and did not appreciate the unicorn horn that was attached to her bridle. It came off pretty early, and Emily and I ended up tag-teaming it and leading her. She settled down pretty well and Emily did a great job with her. Lizzie/Wonder Woman ended up leading her horse after awhile, as well. Even so, the horses and riders did a great job in general – after all, it’s not every day that they deal with small children in costumes running around everywhere as they walk through an unfamiliar place – a great experience for everyone. 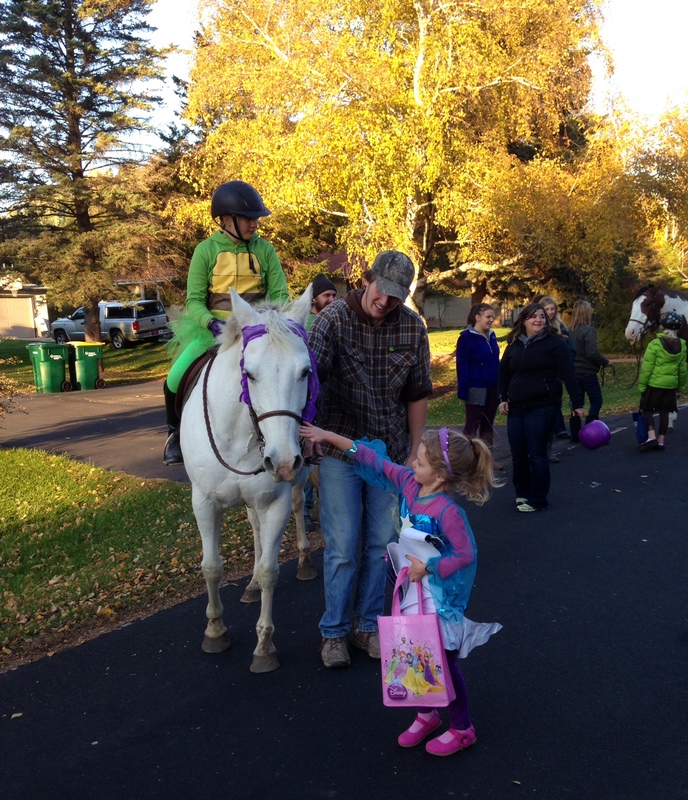 Not only was the night a ton of fun, but kids and horses all brought home quite the haul of treats! Happy Halloween!